Oh deer...what are baseball players using to cheat the system now? Steroids are so yesterday to Major League baseball players. Hear what they're accused of using now to enhance their performance. Here is a great scientific analysis of why Washington Nationals pitching phenom Stephen Strasburg has been so good this year. The main point, it's not any one physical action, but the symphony of them all working together that makes his pitches so good. Outfielders have been doing a great job of catching flies at the new Target Field baseball stadium. And they also have some help in catching moths flying around the lights during night games. A kestrel takes up residence at the top of the rightfield foul pole during the games and patrols the green outfield for the flying bugs. And fans seem to enjoy it. Here are a couple videos of the Target Field interloper. They have lots of tasty new food options at Target Field. It's good to know that "moth" is being eaten there as well!!! Forget laptops. Joe Mauer's getting a torsotop! According to a recent article in Popular Science, Wearable Computers for Pitchers Could Come to Major League Pitchers. Seriously? Yes. At $200 a pop, the wired compression shirt is out of my budget, but for the million dollar salaried players and the franchises that hire them, it might be worth the cost -- pitching injuries cost the league upwards of $54 million a year! Craziness. In case you haven't yet gotten your fill of Target Field opening stories, here's the science angle. Target Field is LEED-certified green for a number of its design features. Also scientifically speaking, I'm interested to see how factors of wind, humidity and heat will impact the Twins' bats this season at home. With a new dome-less stadium opening up this spring, Twins baseball fans will have to be on the lookout for rainouts. But the new Target Field will be looking for a good soaking now and then to help it stay one of the "greenest" stadiums in the Major Leagues. Read all about its unique "green" design here. PROF TAKES ONE DEEP: A painting of the author hitting a home run from league photo files.Courtesy PROFESSOR EMERITUS PETER BAGNOLO&#039;S FILESI won a Ford Foundation Fellowship in Physical Anthropology and come from a family of scholars and medical people, so I know a bit about human structure and about drugs like steroids. Steroids tend to interfere with eye-hand coordination eyesight and reflexes of many who take them and becoming muscle bound is a detriment to the lightening reflexes needed in hitting a baseball. As Ted Williams proved, eyesight and stellar reflexes along with incredible eye-hand coordination and pitch selectivity, are the secrets of hitting a baseball frequently. Hitting it far depends on one more thing the ability to hit the bottom half of the baseball, as Ruth pointed out. Muscularity and brute strength are neither a necessity nor a prerequisite, and, in fact are sometimes a determent. There are several factors which caused the phenomenal rise in home run production. But was it really phenomenal? Not according to historical data, which reveals that technological discoveries often lead to an increase in that which is favored among human endeavors. Below are some examples of the gradual and sometimes herky-jerky rise in home run hitting. In Babe Ruth's era the average distance from home plate to the center field fence was 450 feet, today it is 405 feet. Back then the alleys were, on average 400-415 feet, today they are 368-385 feet. The balls were livelier in 1991 and again in 1998. The mounds are now ten inches high, in Ruth's time and mine, they were 15"-18" (reg's said 15" but most teams cheated to 18"). Ruth’s home production in 1920/1921 was phenomenal, because at the Polo Grounds, which at the time was the Highlander’s/Yankees home park shared with the Giants, the center field fence was 490 feet from home plate . I suggest reading Bill Jenkinson’s book, THE YEAR BABE RUTH HIT 104 HOME RUNS. In it he displays charts showing doubles, triples and sacrifice flies as well as fly outs which today would all have been home runs. I did a similar computer study/chart based on ball park size, which over his career, were it played out in the era from 1986-2009 and played all of it as an outfielder, he would have hit more than 1500-1650 home runs. Bill Jenkinson shows Ruth, if he simply had the same career, pitching included, in the modern era, would have hit about 1150 home runs. My totals give him a few more years in the outfield and exclude the pitching. When I added the pitching as did Jenkinson, I showed Ruth hitting 1250-1400 home runs. Many great hitters like Ted Williams increased their home run per times at bat as they grew older, as did Ruth in 1927-1928. In Ruth's youth both leagues hit about 400 HR's per year, the average to lead the league by a player was 9.5 HR's from 1901-1918, both leagues gradually increased HR production in starts and jumps and now both leagues hit 13 times that figure or over 5100 HR's per season. That increase has nothing to do with drugs, the people who are ignorant of the realities of such data and the natural evolution of sports records, viciously cling to accusatory slanders. Basketball and Football have seen records expand as well. Human beings are bigger, faster and have better health than they had in 1920. It is the natural evolution of human events. When Ruth hit 54 in 1920/59 in 1921, he hit more HRs, than 14 of the 16 entire teams. When I was a kid very few guys hit 25 HR's in a season now many do every season. Barry Bonds and others, if they took steroids, hit HR's, in spite of Medicines and drugs containing steroids. By the way, at age 32, in a game, I hit a brand new Spaulding baseball 436 feet. 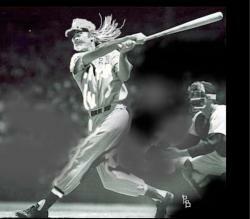 In my prime the farthest I ever hit a ball was 420 feet. I was NOT stronger at age 32 than at age 18/19/20. Perhaps some senate committee ought to investigate if Baseball executives lied about the increased liveliness of the baseballs and is so put the commissioner on trial. Did they liven the baseballs to avert the strike in 1991/1994 and again in 1998 onward? They wanted to fill the ball parks and make enough money to hold them in a short season. They also hoped that the players hitting so many home runs would deter them from striking, they were wrong and never forgave the union for that. Take a look at the short season stats and the year Bagwell had. Superballs were flying out of ball fields like Geese in a park. If most players took steroids how come they all didn’t hit as many HR’s as Bonds, Sosa, ARod and McGwire? Why did everyone’s HR production gradually rise to 13 times what the leagues hit before 1920? Maybe the non-scientific accusatory naysayer’s can understand one thing. It is not news if everyone can do it. When Ruth made his run or 12 home run championships, that was tremendous, that was genius, that was miraculous. When Hank Aaron, Sammy Sosa, Barry Bonds, Mark McGwire, ARod, Ken Griffy Junior and those who followed were blasting 50 home runs with ease, they were surrounded by a huge number of other hitters who were hitting 25. 30, 35, 40 and 45 home runs. The leader of that parade is not really a very special one because it was not as difficult as it was in 1920/1921, 1927/1928. In 1920 all of the players in Major League Baseball combined hit a total of 630 home runs, Ruth hit 54 of them, or 8.6% of the total. In the year 2000 all of the players in Major League Baseball combined hit a total of 5,693 home runs or more than nine times as many as were hit in 1920. Jeff Bagwell led the NL with 47 not quite 1% of the total. Was every one on steroids? No, shorter fences, lower mounds, and much livelier baseballs made the records, not drugs. Why are so many home runs being hit at new Yankee Stadium? 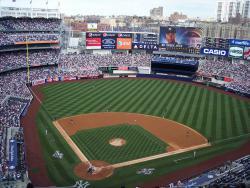 House of home runs: Home runs have been soaring out of new Yankee Stadium at a record clip. Is there any science behind the factors causing that to happen?Courtesy The Silent Wind of DoomI wish I would have come across this information a week earlier. I could have passed it along to Twins manager Ron Gardenhire and maybe helped the squad avert the disaster it ran into this weekend in the Bronx. National Public Radio devoted a half hour to discussing the scientific and statistical factors that might be at play in the increased number of home runs being hit at the new New York Yankee Stadium. As any Twins fan can tell you, the homes kept flying out of the park this weekend when the Twins visited the new stadium, resulting in three-straight Twins losses. Most puzzling about this increased number of homers is that the interior dimensions of the playing field were planned to be exactly like the old Yankee Stadium. You can hear the stadium discussion here. If you don't have audio capability on your computer, I'll quickly summarize the gist of the discussion. First, the numbers. This report was done on May 15. Up to that point, there had been 47 home runs hit in the new ball park compared to 24 homers in the same number of games played at the start of last season in the old park. This year's average is a whopping 3.6 homers per game. A wind studies specialist points out that the alignment of the new stadium is slightly different than the old stadium. In the new park, home plate to right field is directly set up west to east. The old park was shifted about 20 degrees in a northwest to southeast orientation. And predominant winds in the area go west to east. Another wind factor is that the new stadium is shallower from top to field than the old one. That means less deflection or impeding the wind flow into the new stadium than the old one. And while the posted outfield wall dimensions of the new stadium are identical to the old park, there is a difference in right field. There, the once concave outfield wall is now straight to accommodate a new out-of-town games scoreboard. Six home runs hit this year landed in areas behind this new scoreboard that would have been in the park in old Yankee Stadium. A sports writer from ESPN on the show also points out that the sample of games to draw any conclusions from right now is just too small. It's standard practice to figure in three full seasons (243 games) to come up with an "even" reading of what's normal for a ballpark, he notes. The 13 games played so far amount to just 5% of that reading. Two line-up considerations for the Yankees. They've had a couple starting pitchers struggle early this season an injuries to position players have made their line-up be predominantly left-handers, who tend to hit the ball to right field more than right-handers. This year's baseballs might be flying farther in general, too, he said. Home run production is up all across the major leagues so far this season. So why do you think more home runs are being hit more often in Yankee Stadium? Share your thoughts here with other Buzz readers. I know for me, it gives me one more great reason to hate the Yankees.